What We Do — The Rev. Linnette C. Williamson Memorial Park Association, Inc. The Park Association was founded in 1994 as a neighborhood empowerment project for low-income, disadvantaged residents to use our nonprofit, nonsectarian organization as a tool to “learn by doing” while improving their neighborhood. As Central Harlem continues to experience dramatic changes in the demographics of the community, our original purpose has been expanded. We now also serve as a vehicle to bring together an increasingly diverse racial, economic, religious and cultural population for the benefit of all. 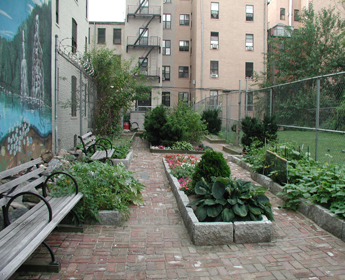 The conservation for public use of our three vest-pocket parks and community gardens, and one “open-space” children’s playground – two of which are owned by The Park Association and two by the New York City Department of Parks and Recreation – is the core service provided by our land trust. Without the protection and maintenance of these properties by the volunteers on our Board of Directors and in our membership, none of our other community services – all critical to improving the quality of inner-city life – would be possible.